An interview with Ida Lee of Wyndemere Senior Living, Wheaton, Illinois. 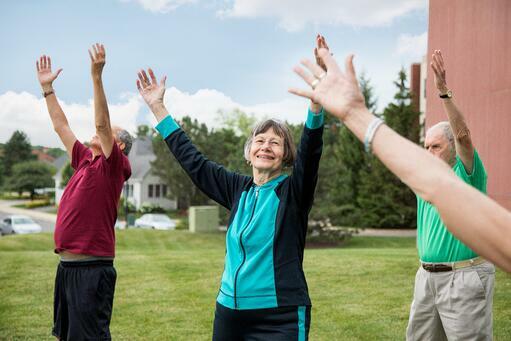 In June of 2018, residents at Wyndemere Senior Living in Wheaton, Illinois were challenged to participate in a fitness program called, Exercise Across America. For every mile exercised, residents received 100 miles on distance on a map, towards their favorite location. By month’s end, one resident had blown past the others by walking 109 miles (10,900 map-miles towards her Los Angeles, California destination). Ida Lee walked nearly four miles a day to achieve this goal and according to Ida, June was a “bad” month as she had additional commitments that took away from her exercise time. The closest runner-up accumulated 78 miles. Ida Lee, age 79, has always preferred walking for exercise. She began walking longer distances in January 2018, after realizing she had extra time in her day. She also discovered that the Health app in her iPhone would track both her steps and walking distance. Recalling an exercise program that her sister did a few years ago, Ida decided in February 2018, to make walking 10,000 steps her daily goal. What are the three biggest benefits you’ve seen since you started walking? Answer: It gives me a sense of accomplishment. Walking 10,000 steps takes at least one hour and 40 minutes so it keeps me busy. It also helps stabilize my weight because I have a healthy appetite. Do you have any tricks or secrets that help you get you going on those rough days? Answer: If I am really busy I don’t worry if I don’t meet the goal. On hot days, I walk early in the morning and late in the evening. Also, keep your phone in your pocket or in a small purse with a shoulder strap. What do you do in rainy weather or during the winter? Answer: In winter, if the sidewalks are too icy, I walk the halls in our large building. Outside, I wear layers of warm clothes in winter and a raincoat on rainy days. I usually have my two Cocker Spaniels as walking companions so an umbrella is too much bother. What tips can you recommend to others to get the most out of a walking program? Answer: Don’t try to walk 10,000 steps all at once. Take several short walks of 30 minutes or less. I average 100 steps per minute. What are the biggest challenges you have with trying to get a walk in every day? Answer: In January 2018, I began to suffer from episodes of vertigo that lasted from 20 minutes to several hours. Most of the time, I have been able to reach my walking goal on these days. Days when I’ve scheduled too many sit down meetings are a challenge, also. Weekends without plans often lead to a “couch potato” problem. What keeps you motivated to keep on going? Why do you continue to do it? Answer: I feel so good at the end of the day if I’ve reached my goal. When I add up my total miles for a month and I’ve reached or exceeded 100 miles, I really feel I’ve accomplished something. Ida plans to continue walking 100 miles per month as long as her body allows. “I think my two artificial knees will last a long time, especially if I keep my weight under control” says Ida. She hopes to walk a 5K in Waukesha, Wisconsin next year. “The last time I tried it, I injured my hip because I hadn’t trained before the walk.” Even if Ida forgoes the 5K, she will still be keeping busy. In addition to walking, each week she attends two chair yoga classes, two balance classes, and occasional aquatic exercise classes. Wyndemere may have to rename that fitness program Exercise Around the World just to keep up with Ida. Interested in offering wellness for your residents? Click below to find out about our consulting services. Need some inspiration to get moving this spring? 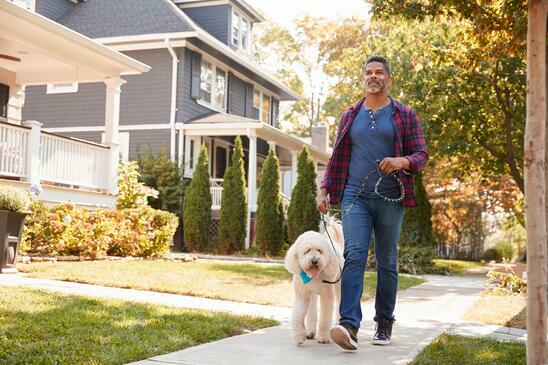 Here are five reasons walking may help you kick start your spring fitness routine and your commitment to moving again after a long winter. No matter if you’re a beginner or a lifelong lover of walks, sometimes you need new reasons to lace-up and move. Typically springtime means it’s warming up, but it's also just cool enough to enjoy the sounds of nature before the sweltering heat sets in for the summer. Springtime weather also means the walker can experience the flowers and trees blossoming into those bright beautiful colors that make us fall in love with this special time of year! Use the opportunity to get out and soak up some Vitamin D (just don't forget your sunscreen) and increase your serotonin levels, which is known to put some pep in your step and a smile on your face. Starting a springtime walk is a great opportunity to interact with other people, and research shows that social connections can positively influence your health. In addition, fitness trends predict that most people are more likely to start a new habit right after the New Year and just before summer, making spring the peak time to invite a friend for a walk. The support gained through social connections can also make getting outside on a regular basis more fun and consistent. Winter is the season correlated most highly with depression. Many believe there are three major factors behind this. First, there is the holiday season with all the stresses of shopping, travel, and overspending. The second reason may be the dearth of sunlight and the scarcity of vitamin D that people are accustomed to absorbing from the sun. Lastly, people are just less active in the wintertime due the frigid weather. Therefore, springtime is a great time to shake off your dibble downer dumps by walking outside and smelling the fresh spring air! Try three 30-minute walks a week and you may be surprised how effective it is; in many ways, it can be considered the cheapest antidepressant! Yep, winter’s over and just maybe you had your share of dessert and the occasional extra helping of your favorite dish. No finger pointing needed; springtime is here, and daylight savings time has arrived, so it’s time to put this in the past where it belongs. This means that you will have all the sunlight needed for a late afternoon fat burning session. Like any form of exercise, walking burns calories and, therefore, fat. Try the walking routine below to maximize your fat burning efforts. Warm up at a comfortable pace for 5 to 10 minutes. Walk quickly for 1 minute. Return to a comfortable pace for 1 minute. Repeat this pattern for a total of 30 minutes. Cool down the last 2 minutes at a slow pace and then stretch. Spring back is only an expression but ask yourself this question. Have you fallen off the wagon of activity and making healthy choices? Well, don’t fret! Take time this season to spring back! The answer for any good knock down is a greater comeback. Spring in definition means, to leap, to jump, or to arise from. Take the term to heart and commit to spring walking.